Broken laptop? Don’t worry we can help! Bluefish Computer Services specialise in laptop repair, we can repair your laptop quickly and economically with as little fuss as possible. We offer fixed prices where possible on all our repair work and all work comes with a guarantee. Just Contact Us by email or phone and let us know your laptop problems and we can give a quick quote or book an appointment where we can take a look at it. 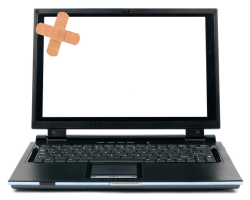 We undertake repair work on all the major laptop brands including Dell, Acer, Asus, Toshiba, Sony, HP, Advent & Fujitsu etc. We are flexible, work can take place in our workshop or when convenient and practical we can also undertake work at your home or place of work if required. We aim to turnaround the repair as fast as possible to the highest standard, no need to send your laptop away to a remote repair centre we undertake all our work in Chichester. We even offer a free collect and return service within the Chichester area for your convenience.